Are you Cool enough to hang in The Bull City? Are you looking for some fun this weekend? 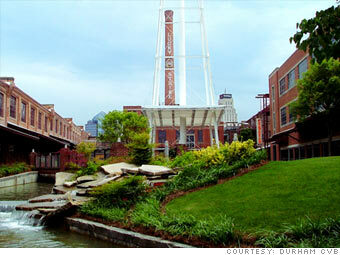 If you are Cool enough to hang in Durham you will want to check out these Hot options! The author will will read from and sign copies of his new book, "The Night Train." Regulator Bookshop, 720 Ninth St.
Durham Central Park, 502 Foster St.
Brightleaf Square, Gregson St. at Main St.
Acoustic/indie/soul. Followed by Nova Echo (rock/electronic/pop). FREE admission. Music by DJ Pittipat. Skates available to borrow. Cost $3 adult, $2 kids 4-17. Misfists/Samhain/Danzig cover band. With Cher Horowitz, Earth Balance, DJ Queen Plz, and Sarah Pheonix: Fire Spinner. Admission $6 with $2 membership. Featuring wine, music, an outdoor projection show and great art indoors too! FREE admission. The Carrack, 111 W Parrish Stt. The Mystery Hillbilles come strong with a variety of early classics to include bluegrass and some of the very earliest country; 40's,50's and 60's classic country, on through to the present. FREE to patrons. Featuring award-winning editors of speculative fiction, Ann and Jeff Vandermeer, who will read from and sign copies of their latest book, "The Thackery T. Lambshead Cabinet of Curiosities." The event also features "The Steampunk Bible", which traces the roots of the steampunk movement, as well as Durham author Mur Lafferty's Afterlife series. There will be short humorous readings by contributors, raffles, and more. Fullsteam Brewery, 726 Rigsbee Ave. Featuring a mixture of Progressive Christian, country and popular tunes. FREE admission, but donations accepted. Sacred Grounds Coffeehouse, 2700 N Roxboro Rd. Da Muthas Reunion Show. This party band is made up of long time music veterans. Playing your favorite classic rock tunes.This is their first show in over a year, get ready for high energy and great music. Tickets: Field Box $9, Terrace Reserved $8, Diamondview $7, Lawn $5. Durham Bulls Athletic Park, 409 Blackwell St.
A Garden Party celebrating the church's community garden with music, food, fun, garden tour. FREE. St. John's Presbyterian Church, 5471 N. Roxboro Rd. Dos Perros Restaurant & Bull City Burgers, 200 N Mangum St. Original masterpieces created by some of NC's finest artists will be auctioned. Live music, food trucks and a cash bar. Proceeds benefit Independent Animal Rescue. $15, or $10 in advance. Ages: 18+ (or all ages w/adult). Tickets: $8, $6 in advance, with $5 membership. Parizade, 2200 W. Main St.
Environmental education program for adults who desire to become familiar with our Piedmont region's 100 species of trees. Format consists of a five hour leisurely walk in the forest. Each participant bring day pack for picnic lunch in the woods together. Pre-registration required. Cost $30. West Point on the Eno Park, 5101 N. Roxboro St..
Walltown Children's Theatre, 1225 Berkley St. The class is taught by local volunteer teachers, which means a different yoga experience each week. Bring: a towel and some water to drink. FREE. Durham Central Park, Hunt St. and Foster St.
Dinner hours - call for time. James Joyce Irish Pub, 912 W. Main St.
Music by Peter Holsapple. FREE to patrons. DJ Piddipat (Pat Murray) will spin old school and r&b music from her prodigious music collection. Bring lawn chairs, blankets, picnics, or simply dance the night away. FREE all-ages event. Pavilion at Durham Central Park, 501 Foster St. Celebrate a year's worth of birthdays, with ice cream and cake. Please send RSVP to smurphy@nccumc.org. I recently had the pleasure of volunteering at a Girls Rock NC event in Durham. I was not aware of the program until a few days before the "Rockin" finale at Motorco. A friend contacted me and told me a little about the program and said they needed volunteers to help the girls with makeup and hair before they performed. It sounded like a good enough cause so I agreed to help. WOW, was I in for a treat. Have you ever walked into a room or been surrounded by people that just gave off a powerful vibe? I was overcome by the contagious energy and high spirits. The girls ROCKED the house with their incredible songs, music, confidence and style. They cheered positive affirmations and brought tears to my eyes. I stood their like a proud parent and a Proud Female! I was so touched by the event and will definitely be involved with Girls Rock NC in the future. The following is a small clip of one of the 10 different performances. Girls Rock NC is a nonprofit organization that runs programs that encourage girls to be confident, creative members of their communities. Girls make bands, have workshops in teamwork, body confidence, zine-making, DIY clothing, recording, Tech Talk, songwriting and more, and are supported as they speak up and share their experiences as girls. We’re part of the international Girls Rock Camp Alliance, helping each other stay true to our mission–empowering girls! Close to 1,500 girls around the globe will have the rock camp experience in 2011–and we also have a women’s ‘Rock Camp’ to raise money so more girls can attend camp through scholarship funds. NO MUSICAL EXPERIENCE OR INSTRUMENTS NECESSARY TO PARTICIPATE IN ALL OUR PROGRAMS! To Pre-Inspect or Not To Pre-Inspect? To Pre-Inspect, or Not To Pre-Inspect? Stacie: Having a pre- inspection allows the Seller to be informed of any issues upfront, and allows time for corrections to be made before the buyer views the home. Sharing a pre-listing inspection report with a potential Buyer is a powerful marketing advantage! Seller: I don't want to pay for an inspection. Stacie: I can recommend a Home Inspector that requires NO PAYMENT until your house sells (or if it is taken off the market). In other words, it costs you nothing until closing day. Seller: Why would I want to do this when the Buyer will still have the home inspected? Stacie: Peace of Mind! You will know of if there are major issues, and have time to get estimates for repairs. Who wants to be surprised? If you were buying a home wouldn't you feel more comfortable knowing that the property was pre-inspected? Seller: What if the Buyers Inspector finds something wrong? Stacie: The inspector is always going to find something wrong. No major problems should be found by the second inspection. It's in a seller's best interest to have the home as ready as possible before the inspection. It can cost more to address a problem later, you may lose the buyer or end up lowering the sale price. Fix it now or deal with it later. You can also price it reflecting the work that needs to be completed. However, keep in mind that certain types of financing require the home to be in specific condition, and that the Appraisal could become an issue. Seller: What if the Pre-Inspection uncovers something major that I don't want to tell the Buyer? Stacie: Any defect that is detrimental enough to kill a real estate transaction is likely going to be uncovered eventually anyway. It is best to discover the problem ahead of time and make repairs and disclosures as needed. When a buyer tours a home that they are considering purchasing, they can be presented with the inspection report. The seller can then show what, if anything, has already been taken care of. This can be very comforting to a buyer and help them make a decision when comparing homes. I usually suggest pre-listing inspections to my sellers. Many have chosen not to do them but I think it helps in a competitive market to be above the standard, not to mention, it may help them sell their homes faster! What are your thoughts?